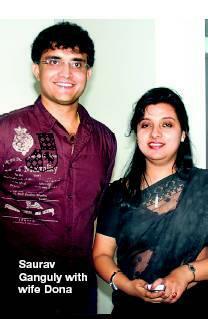 Sourav Ganguly has lived a life of luxury as he comes from an affluent family. But this does not mean that life has been a ‘walk in the park’ for Dada. As much as his cricketing career has been a ‘tale to tell’, his personal life is also no less than a movie script. Dada is not a man to express his emotions in words, so when it came to the love of his life, he kept his words aside and went to action mode straightaway.rnrnAll of us know the old adage ‘Love Thy Neighbour’, but Sourav took it a bit too seriously when he fell head over heels in love with his next door neighbour, Dona. The two familial houses shared a common boundary wall.rnrnSourav and Dona grew up together and were best of friends. Like a true love struck teenage hero, Sourav would take a drive around Dona’s school with the hope of seeing her. But all was not rosy candy-floss stuff like a KJo movie. The families drifted apart and became sour enemies. Like legendary Romeo and Juliet style, any kind of alliance between the two families was completely unacceptable. Even though the two families kept a distance, Sourav went to watch Dona perform Odissi recitals and Dona watched his matches. The cuteness of their story is surely going to warm every heart.rnrnThe couple saw to it that they kept their sweet secret under the wraps. Though Sourav’s family was adamant at not approving a non-Brahmin girl as their daughter-in-law, our Dada is Dada. After Sourav returned from his spectacular Test debut at Lords in 1996, they decided it was time to tie the knot. At that time he was the ‘toast of the town’ and his household was in a celebratory mood.rnrnSourav called up Moloy Banerjee , the highly respected Bengal cricketer, and confided in him. He later agreed and said, “Can’t say no to Maharaj.” On August 12, 1996, they were married by the registrar, in Banerjee’s living room. When the families got the news, all hell broke loose, but gradually went on to accept the decision of their children. A formal wedding was conducted on February 21st 1997. This is the date the couple celebrates as their wedding anniversary.